Once upon a time there was a picnic. The picnic liked reading and listening to writers read. The picnic was hungry to be consumed by words. So the picnic decided to attend the literary festival. It wanted to be with beings like it: happenings that are celebrations of sharing. But the picnic also invited other beings – those who would imbibe it and help it to fulfill its destiny. A tall engineer, who was reading about Alexander Dumas. He was wearing attractively grey Tom’s shoes. It’s always good to have an engineer at a picnic in case the blankets need to be redistributed or the basket re-calibrated and redesigned. A skier who was a lawyer who was a sometime falsetto singer, who was mostly a writer who wrote about dead animals and baseball (not usually together). He was wearing a pleasant turquoise shirt – which made the picnic think of the sea. A writer, and an editor, who had on a bright red dress, and who was a principal picnic packer (a picnic cannot exist without such a person). The picnic was particularly fond of this person, because she was an organizer as well as a writer and packer. And red looks good against the green grass of the picnic area. A writer who was a vegetarian and who wrote about relationships and who was principal picnic packer #2. The picnic was fond of this person in particular, because she had very large, chic black sunglasses under bangs – which made the picnic think it was starring in an important French film. The musician’s wife = ideal audience member with beautiful long hair and large blue eyes. She poured oil onto plates with what the picnic saw as very elegant gestures. This made the picnic feel fancy. A cyclist who was also Picnic Packer #1’s husband. Driver, helper, listener. The picnic liked him, because he made things happen, and put things away, and made it all seem easy and put everyone at ease. The picnic felt relaxed. 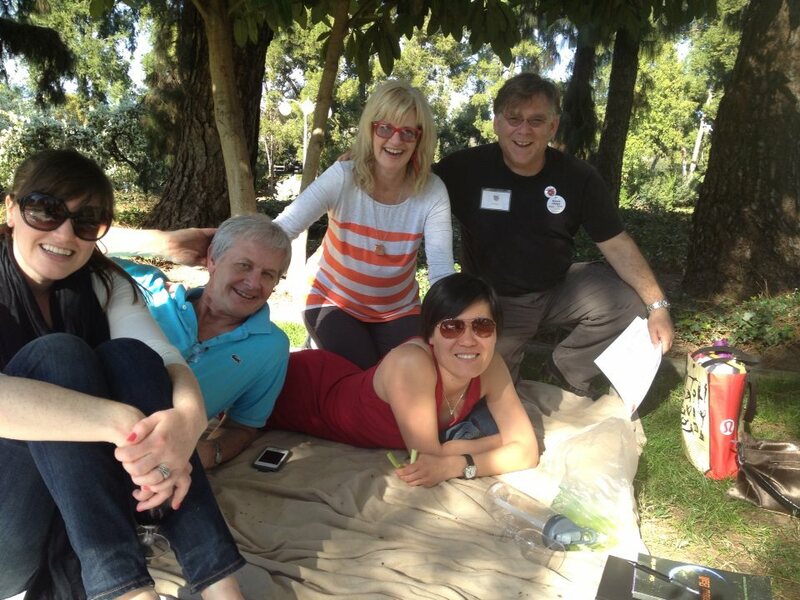 The picnic was deliriously happy to be surrounded by so many different sorts of people and words. Its lids flew off, corks popped, and wrapped cheeses unfurled their textures and fragrances. The tops of sealed bowls hissed open. The bread cried, “slice me!” The wine poured itself out. Once the wine glasses emptied, the picnic poured itself into memory. 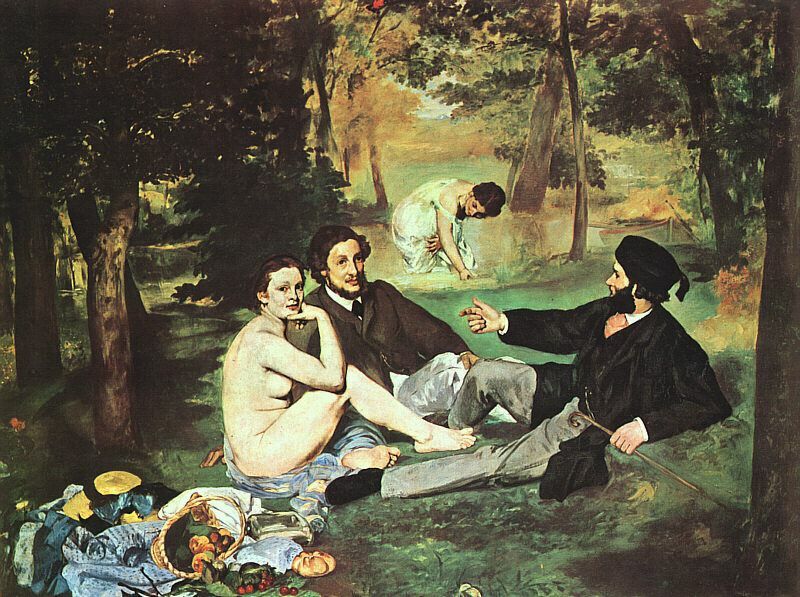 This was the picnic’s most profound joy: to continue to exist beyond its physical parameters. To live and to nourish the mind and the imagination. Which is why, the picnic will always remain especially fond of writers. huzzah! and here’s to more creating and celebrating! Here’s to being able to bring un peu d’insouciance française à l’un de vos pique-niques très bientôt! Merci for reading and supporting, as always Mme N2!